Buddy Holly’s classic pop with a dash of Rolling Stones and Bo Diddley’s unmistakable influence! It’s easy to forget that this track was originally penned by Buddy Holly. I think it’s probably true to say that most people think of the Stones’ version first when ‘Not Fade Away’ comes up in conversation. Or perhaps they can hear Bo Diddley’s unmistakable rhythm powering things along. What I’ve tried to do with my version is honour all of the above. If you’re after the original Holly version, you should be able to put it together by following the rhythm part alone following a quick listen to the original. A little bit of re-styling may be necessary but all the basic essentials are there. To achieve Bo Diddley’s guitar sound, you might want to try adding a tremolo pedal in line and setting it so that the tremolo ‘pulses’ offset the main rhythm of the piece. The basic rhythm components are in place here, if you want to take the song in that particular direction. The Stones’ version is, once again, pretty similar and so you shouldn’t have any problems siphoning off this classic, too. Three versions in one – not bad, huh? In addition to all this, I’ve taken the liberty of getting my slide out and playing the melody this way. Those of you new to slide playing might like to give it a try – it’s not a particularly difficult tune to play. That covers the basics, now on to the tune itself. Let’s take a few moments to consider the rhythm part to this track. The chords are syncopated against the basic rhythm of the piece and, unless you read music fairly well, the only way you’ll get this one in the pocket accurately is by listening carefully to the audio track. It’s more difficult to explain something like this particular rhythm than it is to pick it up by ear. Of course, learning to play this sort of thing by ear is an essential tool in the guitarist’s armoury in any case, but worry if it takes you a while to feel really comfortable with it. It’s probably best to keep your right wrist moving all the time with this kind of playing. Whatever you do, don’t try to play everything in downstrokes – it’s going to make the piece sound jerky and very unmusical. Try to make your picking feel natural, whatever re playing. If you’re new to slide playing, this melody could provide you with an almost perfect learning platform. The first thing to do is to retune your top E string (see ‘Tuning Notes’). Don’t be put off by this slight adjustment – you’re still going to be roll owing the tablature as before and so, realistically, nothing much has changed. I used an old brass slide for the recording, which I’ve had lying around for years. It’s so old I can’t even remember what make it is! But it’s a fairly hefty, plumber’s yard job and it seems to do the trick. People will no doubt tell you that some of the better-known slide luminaries go for a glass bottleneck to get a pure, clean sound, but I personally prefer the sound of metal. If you want to use a real bottleneck, though, you should find that nothing changes too much. As usual, experiment with a range and use whichever you feel suits you best. The basic rules of slide playing insist that you should play over the frets and not behind them as you would when playing with your fingers. If you wear your slide on your third finger, most slide players tend to lay the unused first and second fingers down behind the slide to mute out unwanted notes or overtones, as well as that ever-present string rattle. This takes a bit of getting used to and it might feel wrong when you first attempt it, but you’ll get used to it if you persevere a little. It’s customary to add a fair amount of vibrato to held notes when playing slide. Check out any of the masters of the art (especially Ry Cooder) if you want an illustration. Slide vibrato is right to left along the string as opposed to side to side. Take a while to practise on some individual notes and you should find that ‘shaking’ the slide gently over the note makes the desired noise. Aside from those few pointers, the transcription itself should teach you much of what’s left to learn. Have a lot of fun with the transcription. 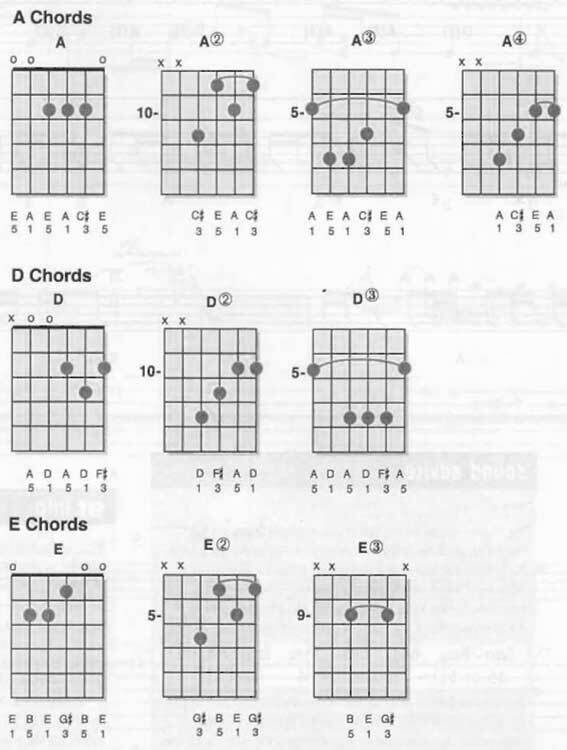 In order to play the slide part of this version of ‘Not Fade Away’ it’s necessary to tune your top E string down to D. If you have an electronic tuner, this won’t present any problem, but if you haven’t, you need to tune the pitch of your top string so that it sounds the same as the third fret on your B string. Another check would be to play the harmonic at the 12th fret of your D string and tune the top E to the same pitch. If any of you have guitars fitted with locking nuts/floating tremolos, then it’s likely that you’ll have to retune the whole guitar. For the absolute minimum inconvenience, a guitar with a stop tailpiece would be the best choice! 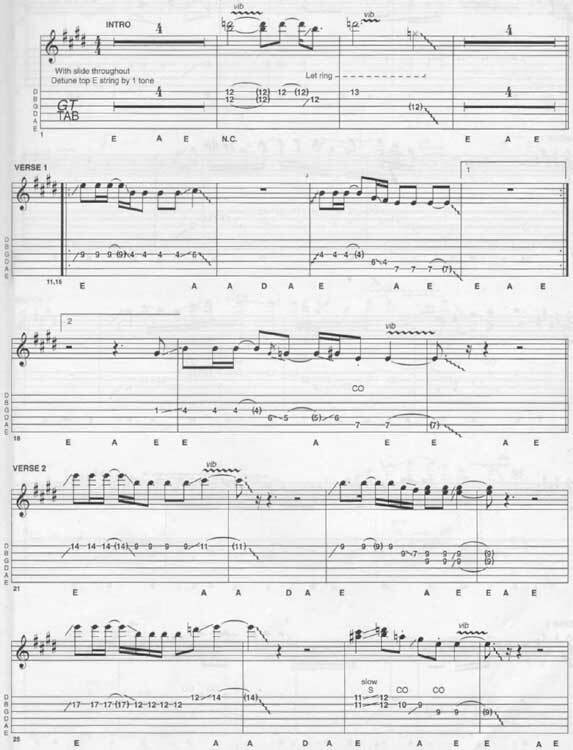 It’s just a part of Bo Diddley Not Fade Away guitar tab and music sheet. © 2012 - 2019 TabsClub Powered by TabsClub 42 queries in 0.290 seconds.